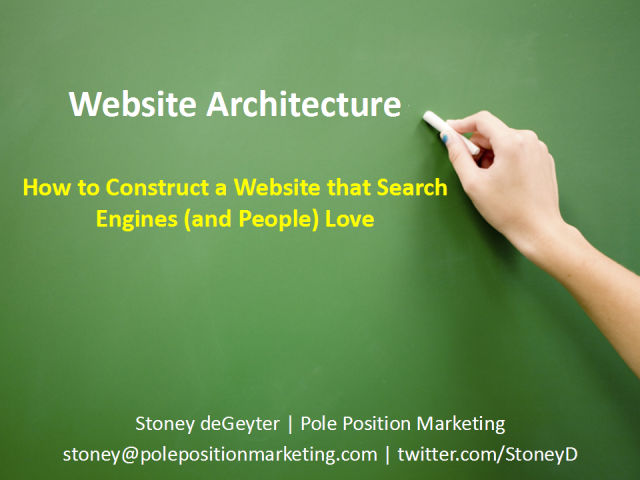 Website architecture is the foundation for a successful online marketing campaign. If your site isn't search engine friendly or customer usable then your keyword optimization efforts will always lack in performance. This website architecture presentation covers the structure of three main areas of your website: Domain and URLs, Internal Links and Navigation, Document and Pages. Within each area we'll look at important Do's and Don'ts when it comes to building and optimizing your website. A proper architectural structure helps the search engines find the content they need to assess your site and give each page a stronger value, and ensures your visitors quickly find what they need and drives them to the conversion point. In the end, strong website architecture will help you improve your site's performance on the search engines, bring in more visitors and increase your sales and conversions.